Analyzing the Facebook group is really a challenge. I recently came across a wonderful tool grytics.com . I tried using that in one of my group and insights are really great ! How grytics.com calculates influencers:Influencers are group members whose posts are the most liked and commented by others. 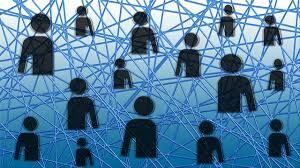 The Influence ratio is based on the number of likes + 2*number of comments. METRICS & KPIS Here you will find the definitions of the various statistics Grytics is providing to analyse your social media groups. Would you like to try this tool? This code checks whether every student get minimum 4 pencils or not. If yes, then print "OK" or print "NOT OK". If you have a double conditions scenario in python, you can use the below code. Make sure you press TAB button after : otherwise you might get "Indent Block" error. You can use HTML tags in python to style your text. Here is the tutorial for using print command and how we can concatenate the string with variables. R has a very easy way to make functions. In this post, we will learn some simple R functions. To do basic graphics in R, I would suggest to download ggplot2 package. In this post, we will learn how to dowload package and create histograms, scatterplot, boxplots. 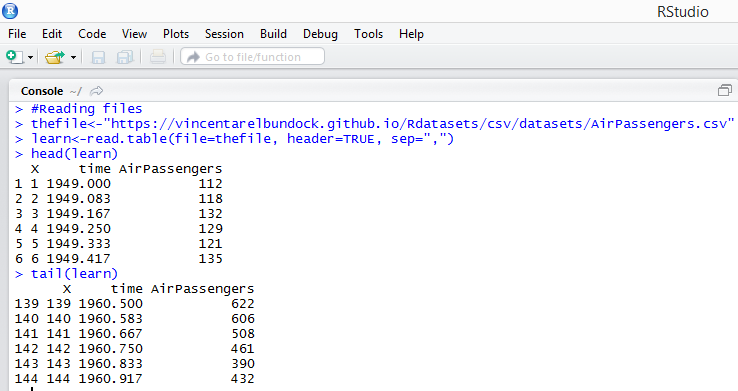 The best way to read data from a csv file is using read.table. Here in this example, I have shown how to read the online csv file and later show the top and bottom rows of data. NA and NULL values are something you will always find in every statistical project. NA is when any value is missing whereas NULL is absence of anything. Functions in any language are very powerful. 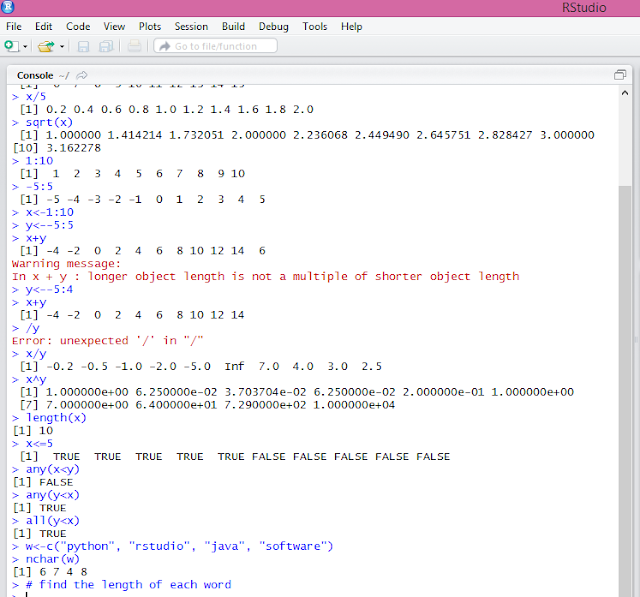 Here we have run some of the functions in Rstudio. A vector is a collection of elements of same type. Example : a(1,4,3,2,5,1) , b("Python", "R", "java", "excel") are vectors. The advantage of vectors are that operations are applied to all elements of vector automatically. Variables are an integral part of any programming language. in R, we have a lot of flexibility in terms of variables. 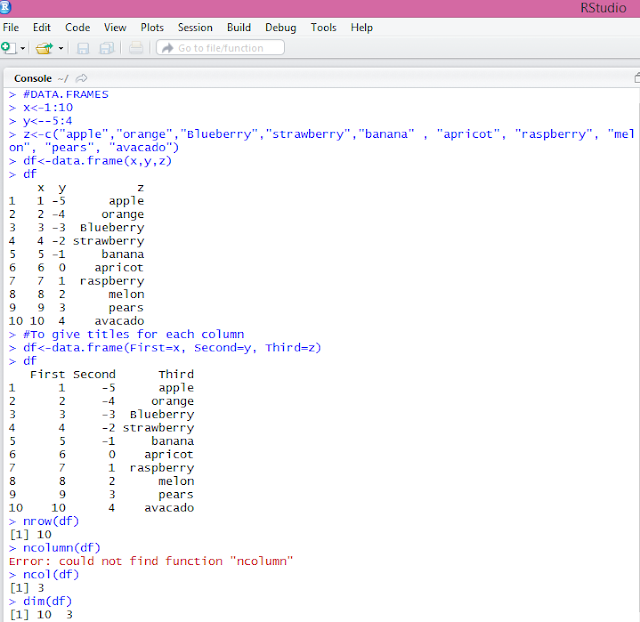 Below in R studio, I have shown in a simplest manner how to use variables in R.
To start running the basic R functions, you should have R downloaded and installed. 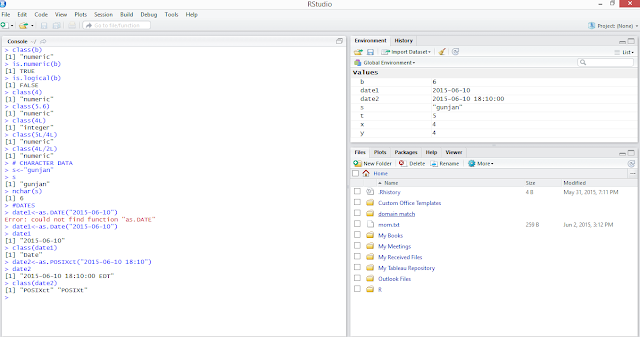 I am using R studio which can be downloaded from http://www.rstudio.com/. In the next post, we will cover Variables assignment.